I literally almost forgot to blog tonight. Which is weird, because I thought about what I was going to write tonight while I was driving home. But then I took a nap, because I was exhausted. I so wish I could talk about what happened today, but I can’t. Because I’m still not sure who reads this blog, but I promise, by end of next week you’ll know what all my crypticness has been about. But until then I promise not to talk about it any more. So let’s talk about something awesome, shall we? Like, what I had for lunch today. 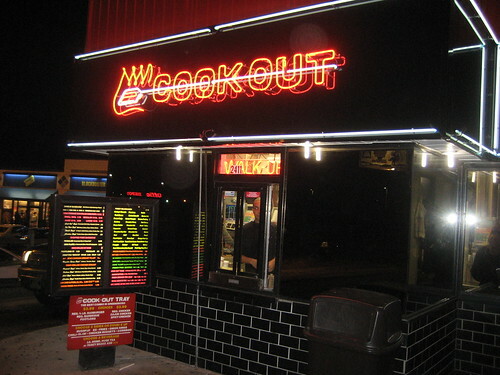 For those of you not around the NC area Cook Out is one of the most delicious places on earth. So yummy. The cheeseburgers are fresh made and big and sooo amazing. Hush puppies and french fries. And of course their scrumptious milkshakes. Definitely not an everyday food, but great for a treat. And as a random point of fact, green may be my power color. Let’s hope it’s a good luck charm, too.